So about a month back I was invited by Clé de Peau Beauté Singapore for a make over and preview of several new exciting launches. On this occasion I got to try the Radiant Fluid foundation first hand as well as learn a few valuable application tips. As I was given the range of the newly released foundation, pre makeup bases & brushes for review, I quickly put them to the test the very next day! Fast forward a month later, here I am about to divulge all you need to know about this fabulous new find. The Radiant Fluid Foundation is a new and improved version of the previous Refining Fluid Foundation. Both are lightweight foundations with sheer to medium coverage suitable for those who wish for a ‘my skin but better’ look. As always let’s start this review with a quick note on packaging. This foundation comes in a midnight blue plastic pump bottle with a gold cap. What’s great about pump bottles is that it allows the product to stay fresh longer as it doesn’t come into direct contact with the environment which in turn allows a longer shelf life. And more often than not, they allow you to dispense just the right amount needed so there is minimal product wastage. As much as I love heavy glass bottles for these types of high end foundations, I find this version actually more convenient for day to day use and most importantly, travel friendly! Clé de Peau Beauté describes the Radiant Fluid Foundation as ‘A completely new type of foundation that veils the skin with layers of light making your skin lustrously dewy and irresistible’. The new ‘Microfacet’ technology used in creating this formula which controls the arrangement of foundation particles on the skin surface to optimize light reflection to create a radiance from the surface as well as within. The most noticeable difference to me when comparing this foundation with the older version was that the radiance it gives was more refined. Almost like a glowy, ‘lit from within’ finish. Where as the older version was definitely more of a ‘wet’ satin dewy look. For those of you who have used the refining fluid foundation before and are keen on trying this, it must be noted that O30 is a slightly less yellow toned than it used to be as well as a touch lighter. The new O30 that I have is almost a neutral beige undertone, so i’d suggest trying out a sample again in order to get a colour match without blindly reordering your existing shade. The Radiant Fluid foundation is a light density fluid foundation that glides on effortlessly. I like that it’s not a foundation that you need to work quickly with and just take your time applying it, enjoying the experience. although on rushed mornings I like to use just my fingers to apply this and it takes mere minutes. Fool proof formula as far as application goes. The coverage is light and somewhat buildable. It corrects any unevenness in skin tone and gives the complexion a uniform appearance while concealing blemishes and pigmentation. You can also go over any areas that require more coverage such as the high points of the cheeks (where there’s usually pigmentation spots from sun exposure) and tap on a bit extra without it looking cakey or artificial, maintaining the natural skin like look. Once set (and yes this does set! unlike most dewy finish foundations i’ve tried) it still does feel very comfortable on the face and keeps skin feeling hydrated. I also love that it doesn’t transfer throughout the day and stays put. I find the formula of this is very forgiving when it comes to dry, flakey patches, something I deal with from time to time. It also smooths the appearance of the skin giving it a healthier look overall. Wear wise, this foundation promises to keep skin looking fresh throughout the day without the makeup looking ‘worn’. And I do agree with that statement to an extent, although I feel that the look does change throughout, just not in a bad way. From application to 2 hours the foundation looked exactly as it was when first applied. As it hit’s the 2hr mark more dewiness develops but not to a point where it’s an ‘oily’ dewy look. Basically I didn’t feel the need to blot at this point. After the 4 hour mark, I did blot my t-zone to refresh the look of the makeup. And then on I did need a few blots every couple of hours. *If you have normal to dry skin you’d probably not need to blot at all! 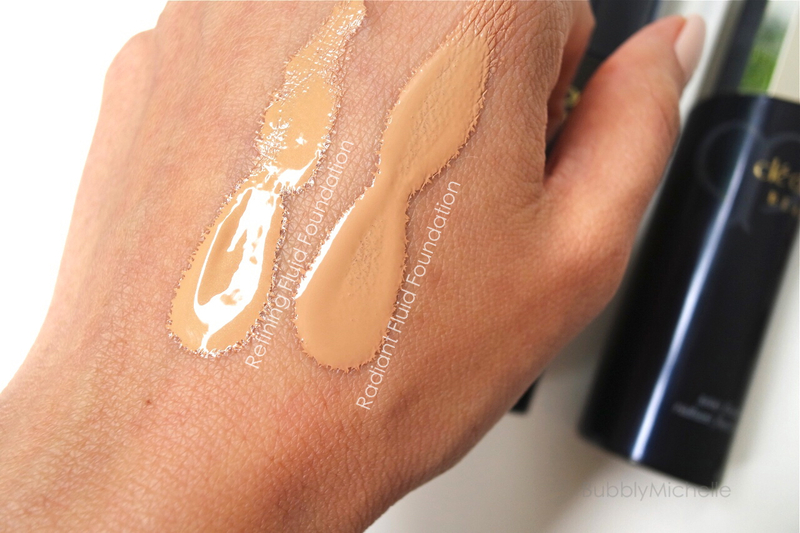 Here’s a look at how the Radiant Fluid foundation looks on my skin. Clé de Peau Beauté Radiant Fluide Foundation is available in 12 shades ranging from I10 (lightest for ivory skin tones) to O60 for the olive tan complexions. In Singapore we have an even limited shade range with colours running up to O40. Also keep in mind the CDP foundations are slightly more pink than other foundations, which is actually normal for Japanese brands. And it can be difficult to get a shade match if you are on the darker spectrum of the shade range, a common issue I face myself being a minority as far as colour matching goes in Singapore. 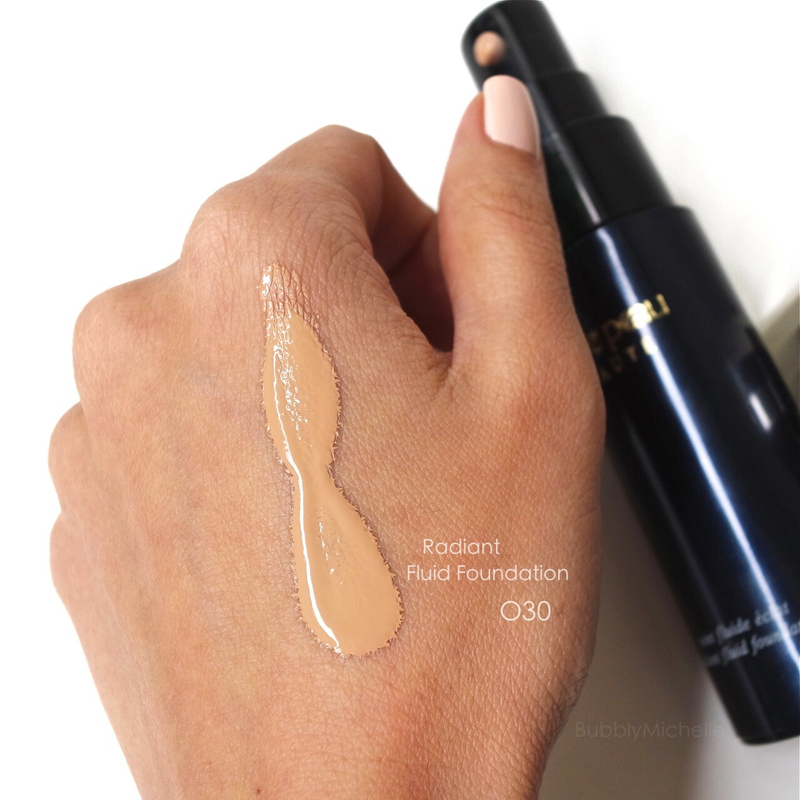 Radiant Fluid Foundation retails at S$175 and comes with 1oz 30ml of product. Sheer Fluid veil primer retails at S$100 and comes with 1oz 30ml of product. At the price, this is definitely not a foundation that’s within everyones budget. However for those with the spending power I highly recommend you try this out as it gives a beautiful, natural finish to the skin. Depending on what foundations you’ve been using in the past this could either be more matte or ‘oily’. As someone who always uses dewy foundations and rarely use matte ones I find this one to have much more oil control properties compared to the other dewy, skin like foundations such as the Chantecaille Future skin foundation, By Terry Sheer Expert and the Lancome Teint Miracle. If you are someone who uses foundations such as Chanel Perfection Lumiere or D&G Perfect Matte liquid foundation, you’d find this is definitely something that requires more blotting during the day. Overall, if you are able to find a good shade match, this is something i’d highly recommend. I love that it can be used even on rushed days and be applied with fingers and still get a great finish, I love that it keeps my skin feeling comfortable and never feel dehydrated. I also love that the new colour O30 is slightly less yellow toned and immediately gives my complexion a brightened effect. In short, this is a dream foundation to girls who like skin like finishes and radiant foundations. It’s currently my holy grail, go-to for everyday wear. Lastly thank you for reading, I hope this post was informative and useful! This foundation looks like heaven! Great post! 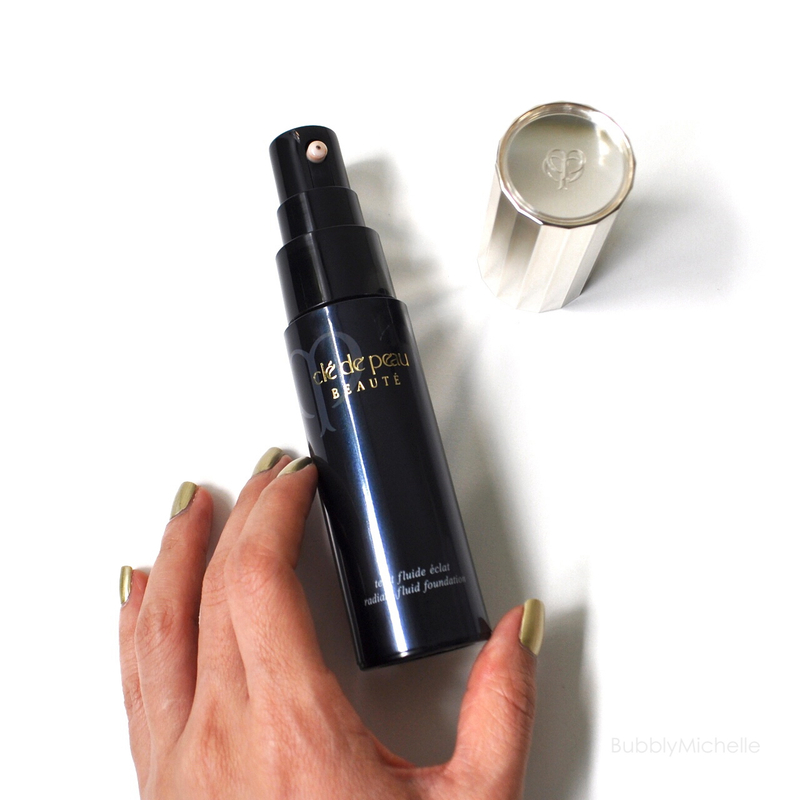 What about the sheer veil primer? What did you think? I’ve heard that it is meant to “blur imperfections” as a standalone product, and that it might work for people who don’t feel like wearing makeup. Is that the case for you? Can you review it? Thanks! What about the veil? Did you like it? I’ve heard that it can act as a standalone product and “blurs imperfections”. Was that the case for you? I’d like to know more… if you could review it, that’d be awesome! Do you like it better than Chantecaille? Or are they completely too different formulas? I adore my Chantecaille! Do you have the ingredient list for this? Thanks in advance. Hi Gail, Unfortunately I don’t think I have the box anymore since I reviewed this a long time ago. Do you prefer this or by terry cover expert ?